Ever need something to get you motivated? Just speaking for me, I do ALL THE TIME. I wish I could say that I’m always motivated to do the things I need to do or live the healthy life I need to live, it’s just not always the case. That’s what Friday Fire Ups are going to be for! 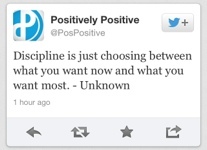 I’ve always seen myself as someone that has had issues with discipline. I am faced with a temptation and my willpower falls. It’s frustrating and tiring. I don’t like it and I want something more. Tonight I saw a quote that rocked my world. Could that be any more simple?? It’s not about giving something up and depriving myself, it’s about choosing what I want MOST. I want to like myself more. I want to feel better, be healthier. I want to push past the voice that says to veg out and instead lace up my running shoes to help propel myself to my goals. I’m done looking at what I want now and I’m ready to fight for what I want MOST!